Everybody, come check out the great deals in the Market! 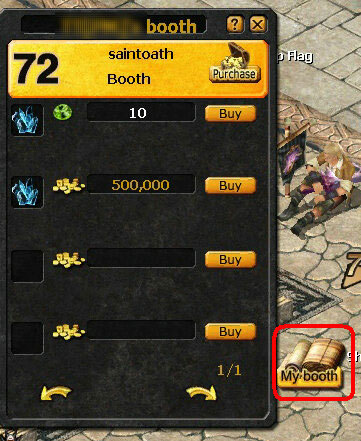 If you are interested in a profitable booth, you can click the shop flag to purchase it. After you pay for it, this booth will belong to you. That means you can even purchase all booths, provided you are rich enough! By then, you will be the lord of the market and the supreme landholder in Eudemons Online! 1. 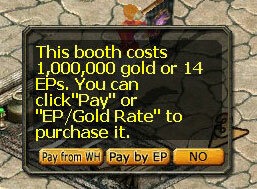 If you don't have enough Gold, you can spend your Eudemon Points to purchase a booth. 1 Eudemon Point is equal to 73,000 gold. 2. Once the booth is purchased, the owner cannot abandon it. 3. Ind.Pur: Individual Purchase. 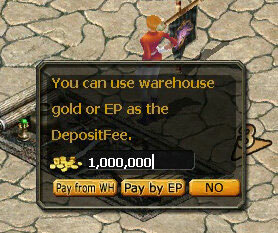 You can spend gold in the warehouse or EPs to buy it. Leg.Pur: Legion Purchase. 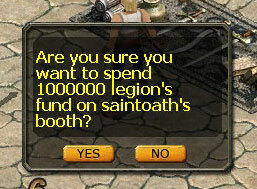 The legion leaders can spend the legion fund (gold) to purchase a booth. After you own a booth, it can bring you huge profits. If somebody wants to peddle in your booth, he/she must pay rent to you every hour. The fee varies in different positions. If you want to use it yourself, you can drive away the peddler, at any time. Note: The system will deduct some taxes from out the peddle fee. 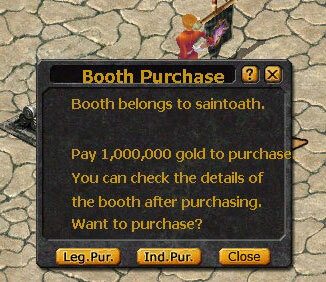 After the booths become available for purchase, the profitable booths will become the main targets of players. There will be a fierce competition, so to avoid your favorite booth being purchased by other players, you can put a deposit on it. (Purchase -> Ind. Invest /Leg. Invest -> +Deposit / -Deposit.) If other player wants to purchase it, he must have enough money to cover your deposit. When you sell or transfer your booth, you can receive a 10% profit generated from your investment. The income is calculated on the basis of your purchasing price and deposit. The more investment, the more income. Make full use of your Gold to bring you rich profits. As the system will collect a 10% tax on merging, the purchaser must pay 120% price to purchase your booth. 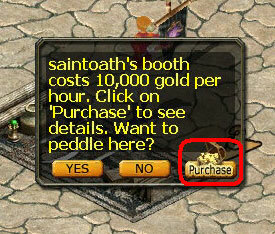 For example: Player A spends 1 million Gold to purchase a booth. 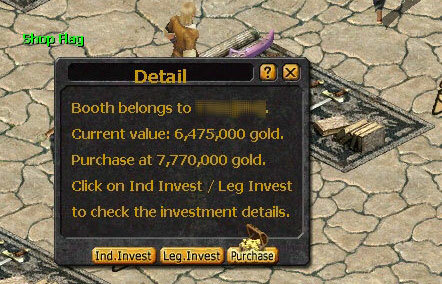 If player B wants to purchase it, he/she must pay 1.2 million Gold. 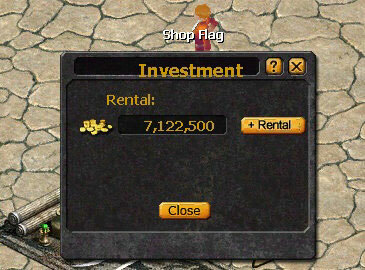 Player A will gain 1.1 million gold, including the investment and profit. 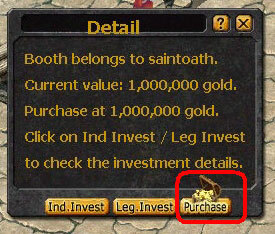 If Player A put a deposit worth 9 million Gold after purchasing, then player B must spend 12 million Gold to purchase it. Player A will receive 11 million Gold, and the system collects 1 million Gold. When you want to collect your income, you can open a booth in the market at random, click on "My Booth" to use the Booth Finding function to find your own booth. Then click your shop flag to open the Purchase panel. 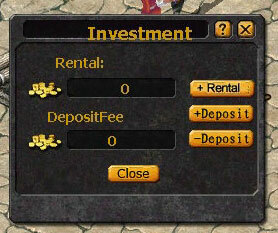 Select "Purchase" and click "Individual Investment" or "Legion Investment", and then click "+Rental" to withdraw your income. The gold you received will go to your warehouse automatically. The business competition is just like a war, minus the gunfire. Compared to the PVP, there are no swords and magic, but the fierce competition makes all players shout: "I'm the king of all! I fear no one!"